In this article, I have compiled a list of 5 free online keyword difficulty finder tools. With these free SEO difficulty online tools, you can get to know how easily you can rank a page of your website for a target keyword on first of page of Google search results. What these tools do is that they tell you a keyword difficulty score. This score is calculated by analyzing the Domain Authority, Page Authority, number of external links, and other SEO metrics of the results that come in Google for your keyword. In addition to this keyword difficulty score, most of these tools also show you SERP analysis of that keyword. With this SERP analysis report, you can analyze your competitors. The only limitation is that they are not completely free and you can perform only limited number of searches per day to find SEO difficulty scores of keywords. Ferzy is the first free online keyword difficulty tool on my list. Next time, when you think to write a blog post, I will recommend you to spend some time with this free SEO difficulty tool as it can tell you the SEO difficulty score of the target keyword with which you want to optimize your blog post. This SEO difficulty score is calculated by analyzing following metrics of domains on the first page of SERPs: Domain Authority, Page Authority, Domain age, and estimated visits to these domains. You can even find this SERP analysis report on its search results page, as shown above. At the same time, you can also analyze your competitors for the same keyword and get to know about their Page Authority, Domain Authority, Domain age, and estimated visits to these pages. The best part is that it also shows other variations of the searched keyword with their CPC and searches. In addition to that, you can also select a region or country to find keyword difficulty and searches to target that specific region only. You don’t need to signup or login to use free keyword difficulty tool of Ferzy, visit the link provided above and get started. All you have to do is specify a keyword and select a region to find its SEO difficulty score, as shown in the screenshot above. It indicates the keyword difficulty score from a scale of 1 to 100 where a higher number represents higher SEO difficulty. The main limitation of Ferzy is that in its free version you can only perform 10 searches per 24 hours to find keyword difficulty score. Serpstat is another free online tool to find SEO difficulty score of any keyword. With it, you can search for any keyword to find its SEO difficulty level, search volume, PPC competition, and CPC, as you can see in the screenshot above. It basically calculates the keyword difficulty score based on the Serpstat Trust rank, Serpstat Page rank, total number of external backlinks, and the number of referring domains. In addition to that, it also analyzes the number of domains with the keyword in title and the number of pages with the keyword in title to find the SEO difficulty score. 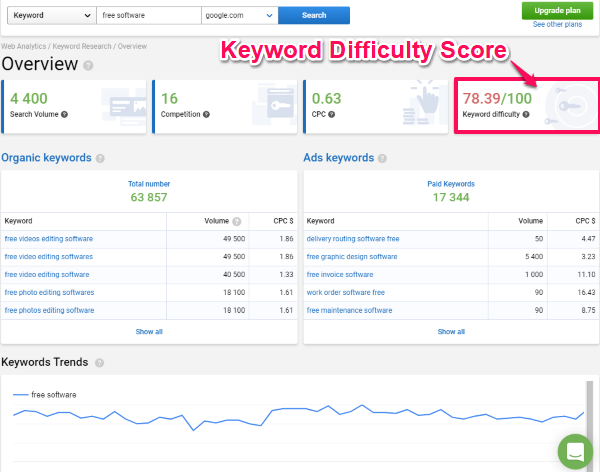 The calculated keyword score is shown between the scale of 0 to 100 where higher number denotes higher SEO difficulty. In its free version, you get around 30 free searches to find SEO difficulty score of keywords in which you are interested. For each query, you will get 10 SERP results. From this SERP results section, you can get to know about the Serpstat difficulty level, page rank, etc. Apart from that, it also analyzes your competitors in the SERP results and displays a competitors graph, competitors in organic search, and competitors in ads. Visit the link provided above to use the keyword difficulty tool of Serpstat. 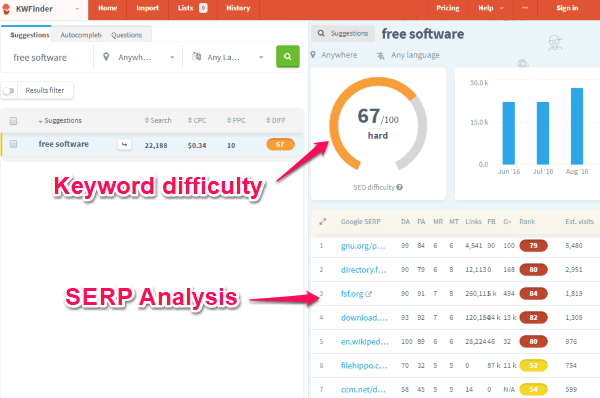 SEMrush is another free online keyword difficulty tool on my list. Similar to other free SEO difficulty tools on my list, it can tell you how difficult can it be for you to get a page ranked on the first page of Google search results for a specific keyword. It indicates the SEO difficulty score from a percentage of 1 to 100 where higher percentage means higher SEO difficulty to rank for that keyword. It calculates this score based on the authority levels of the domains that appear on top of the SERPs for that keyword. In its free version, you will get 10 free queries each day to find the SEO difficulty score of keywords each day. 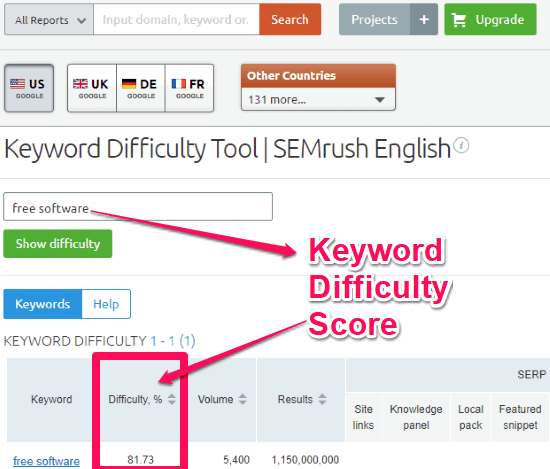 There is no need to create an account on SEMrush to use its keyword difficulty tool. Go to the link provided above and then enter a keyword to find its difficulty score, as shown above. As compared to other similar tools in this list, it doesn’t show any SERP analysis report. However, it certainly reveals some keyword metrics like its search volume (per month), the total number of URLs displayed in the search results for that keyword, and a small trends graph of that keyword. 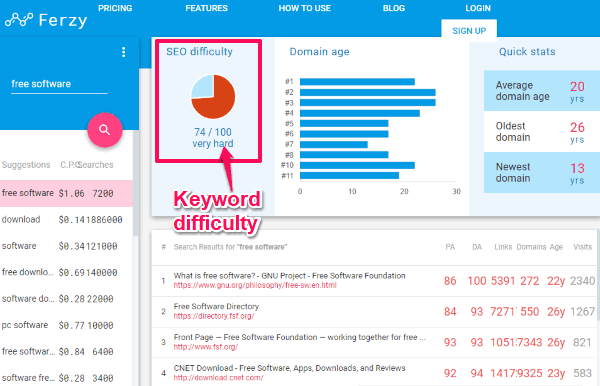 KWFinder is another free tool to find the SEO difficulty score for any keyword. You can search for any keyword to find its search volume per month, CPC, PPC, and most importantly its keyword difficulty score. This keyword difficulty score is calculated on the basis of Domain Authority, Page Authority, MozRank and MozTrust of the URL, and other metrics of the domains on top of the SERPs result. It also counts on the total number of external links, total number of shares on Facebook and Google Plus, and number of estimated visits to the page to calculate the SEO difficulty score of a keyword. 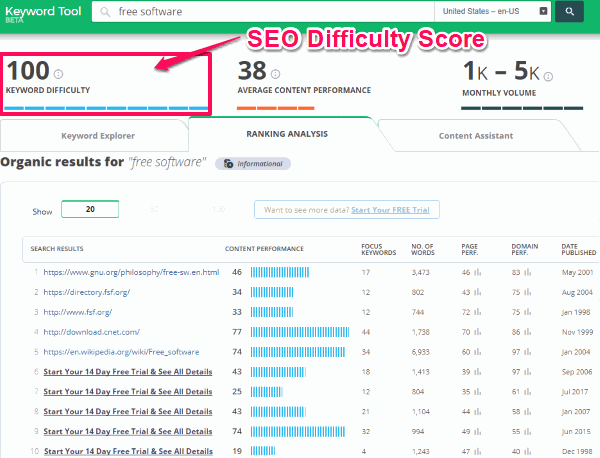 Similar to other free SEO difficulty tools in this list, it indicates the difficulty score on a scale from 0 to 100 where a higher number denotes high SEO difficulty. In its free version, you just get a total of 3 searches per day. Visit the link provided above and then specify a keyword to find its difficulty score. It will then analyze the keyword and display its keyword difficulty score along with the SERP analysis report, as shown above. What I liked the most about this SEO difficulty tool is that it displays related keyword suggestions as well. cognitiveSEO is the last free online SEO difficulty tool on my list. It measures the content performance based on the page performance and domain authority rank. The page and domain performance rank are calculated on the basis of their total number of external links. In addition to these factors, it also counts on the number of focus keywords used on each page, number of words and the publish date of a page to calculate the SEO difficulty score, as shown in the screenshot above. It displays the keyword difficulty score from 0 to 100, where a higher number means high SEO difficulty for that keyword. Content performance value: On a scale of 1 to 100 where a higher number represents high content performance and tough to beat for organic search ranking. In this article, I introduced you to 5 free online tools to find keyword difficulty score. I recommend you to check out these free SEO online tools as they can help you to produce quality content that might climb up to the top of SERPs without much effort. Among these tools, I personally use Ferzy and KWFinder as they provide tons of useful info at the same place. However, Serpstat has also caught my attention as it lets you perform 30 searches per day for free. Apart from these tools, SEMrush also does a pretty good job.